We will end the month with a good news post here at Thailand Footprint. Below is a current picture of the 12 up-country Thai students being sponsored through the leadership and generosity of Heaven Lake Press and their readers. 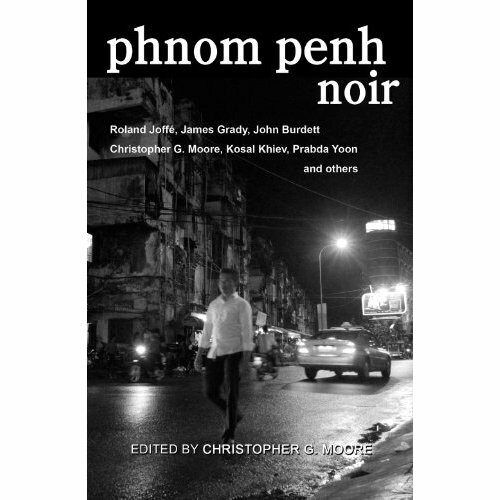 Following the picture is a Press Release from Heaven Lake Press about the anthology, Phnom Penh Noir, edited by Christopher G. Moore and written by 15 authors, which has benefited some of Cambodia’s poorest. There are also links for anyone who would be so inclined to seek out more information about two organizations doing some good: Blood Foundation and FLOW. Bangkok (25 July 2013) – At the heart of noir literature may be wretchedness and misery, but even a very dark fiction is not devoid of hope and has a heart. Heaven Lake Press (HLP) and the 15 authors of Phnom Penh Noir join in helping disadvantaged children’s education in Cambodia. A USD 1,500 donation has been made to two organizations helping poor street children and orphans. The fund comes from 20 per cent of the publisher’s net proceeds and 20 per cent of the authors’ royalties from the first six months of the book sales, since the book was launched in Phnom Penh in November 2012. A $750 donation to Friends-International will help 25 young street children (aged 6-12 years) in their reintegration to public school in Cambodia. The $30 per child will go toward the children’s school fees, school uniforms, school bags, shoes, books and stationery. • Friends-International is a non-governmental organization that works primarily with street children. It runs vocational training, day care centers, residential centers; provides educational, medical, and everyday life services, and other specialized programs to help street children and marginalized urban youth to reintegrate into society, while also supporting their families and communities. Friends-International has received multiple awards and named among the Top 100 NGOs in the World in 2012 and 2013. For more information about the organization or to make a donation, visit its website or Wikipedia. The other $750 portion of the donation goes to Future Light Orphanage of Worldmate (FLOW) as a scholarship for Miss Yim Malida, a 19-year-old student. Miss Yim Malida comes from an impoverished family in Lovea Em district, Kandal province of Cambodia. She is the eldest of four children in her family. Her parents, a farmer and a primary school teacher, were unable to support all their children’s education. Seven years ago Yim Malida came to live at the FLOW where she has received education and nurturing. Her goal is to obtain higher education and a good job to support her family. She has worked towards that goal and is now a first-year student at Vanda Institute of Accounting. The $750 scholarship will cover her tuition and annual allowance for one year. • FLOW is a non-government organization that aims to provide a home, well-rounded education and skills to orphaned and poor children in Cambodia. Established in 1993, FLOW is now a home of 287 such children and youth. For more information about FLOW or to make a donation, visit its website. Phnom Penh Noir is Cambodia’s first English-language anthology of 15 dark short fiction stories by well-known international and Cambodia authors. Heaven Lake Press is a small Bangkok-based independent publisher, which publishes English-language literature focusing on Southeast Asia. The 15 authors of Phnom Penh Noirinclude film director Roland Joffé best known for his Oscar-winning film The Killing Fields, famous international crime authors John Burdett, James Grady and Christopher G. Moore (editor of the anthology), Thai SEA Write author Prabda Yoon, young Cambodian novelist Suong Mak, journalist Bopha Phorn, poet Kosal Khiev, Phnom Penh-based musician, song writer and KROM band leader Christopher Minko, and other international authors Andrew Nette, Bob Bergin, Richard Rubenstein, Giancarlo Narciso, Christopher West, and Neil Wilford. More than half of the authors have given 100 per cent of their first-period royalties to fund our first donation. For more information about the book, visitwww.phnompenhnoir.com.